Mitoni is a Javanese tradition that performs special rituals. This tradition highlights a philosophical meaning for Javanese women, particularly educational values for a baby in the womb. Concerning its development, these values have shifted from its original meaning promoted by both native Javanese women and Javanese santri (students in Islamic boarding schools) women. This present study aims to explore educational values for the baby during Mitoni. A descriptive study of continuity was employed in this research. The findings reveal three characteristics of Javanese women’s perspectives on this tradition based on their subjects, namely: 1) formalistic-traditionalist Islamic view, 2) semi-formalistic-traditionalist Islamic view, and 3) pure Islamic view. Meanwhile, Mitoni, the Javanese tradition, proposes several educational values for the baby according to the Javanese santri women in Pati, Central Java. First, Mitoni provides the baby with the recognition basis of tauheed (oneness of Allah). Second, it enhances parents or prospective parents’ spirit when they educate the baby during pregnancy. Third, this tradition emerges as their effort to give good nutrition for the baby, especially in the seventh month-period of pregnancy. Lastly, Mitoni also demonstrates meaningful understanding for current young generations to preserve this cultural Javanese tradition so as to exist in the future. ULYA, Inayatul. Nilai Pendidikan dalam Tradisi Mitoni (Studi Tradisi Perempuan Jawa Santri Mendidik Anak dalam Kandungan di Pati, Jawa Tengah). Edukasia Islamika: Jurnal Pendidikan Islam, [S.l. ], v. 3, n. 1, p. 114-127, may 2018. ISSN 2548-5822. 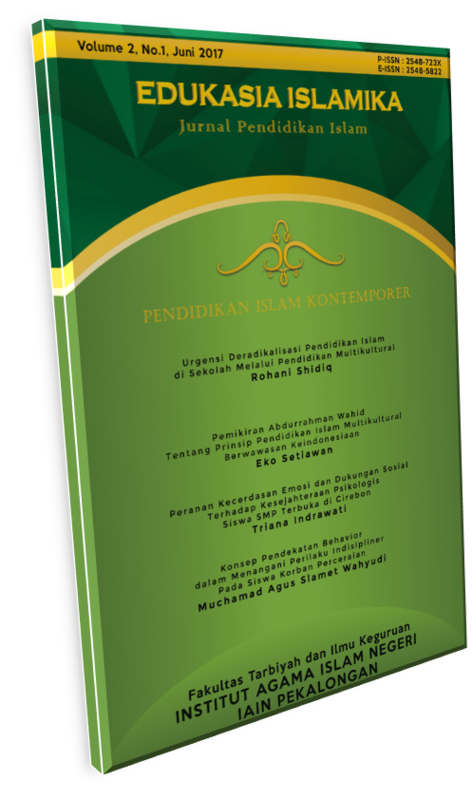 Available at: <http://e-journal.iainpekalongan.ac.id/index.php/edukasiaislamika/article/view/1412>. Date accessed: 22 apr. 2019. doi: https://doi.org/10.28918/jei.v3i1.1412.